Lost in the punditocracy’s freak-out over how scary a centralized socialist economy may be is how scary our centralized capitalist economy is right now. As a great Last Week Tonight segment demonstrated, every single major industry in our capitalist economy is dominated by just a few firms. America is a playground for oligarchs and oligopolies, and a constant uphill struggle for almost everyone else. As a Democratic Socialist, I would assert that our economic dystopian reality is the logical conclusion of the perpetual chase for profits and the nature of private property—in that demand for private property is infinite, while its supply is finite, meaning that so long as demand to own a business remains infinite, the price to acquire one should rise as the supply gets more and more finite. Elizabeth Warren is more of an old school liberal (old school = someone who thinks outside the broken paradigm of the last 40 years that doubles as a major outlier for how economic policy is usually conducted in this country), and she believes that so long as you have strong government intervention to lay waste to monopolies, capitalist markets should work the way capitalism’s adherents say it’s supposed to. This would be a big boon to journalism. As January’s bloodbath in media demonstrated, the ad dollars which sustain my salary are drying up, yet Facebook reported $16.6 billion ad revenue in just the 4th quarter of 2018—up nine percent year over year. Google reported $32.6 billion 2018 4th quarter ad revenue—up 20 percent from last year. Google and Facebook are doing more to kill journalism in America than Donald Trump is, and Warren’s pledge to prohibit companies from “owning the platform utility and any participants on that platform” would be a serious game-changer for America’s Fourth Estate. Podcasting has exploded in popularity, and due to the decentralized nature of podcasts’ distribution network, there is no centralized ad sales force like there is on the print internet with Facebook and Google. A great example of how effective the podcasting business can be is Bill Simmons’ The Ringer. The business is profitable, and most of the site’s revenue comes from podcasts. Google and Facebook are sucking up ad dollars that belong to publishers, and it’s time that the government stepped in and did something to protect its Fourth Estate. If there is one thing that capitalists and socialists can agree on, it’s that privately owned monopolies are bad. Simply enforcing anti-trust laws currently on the books would do wonders for our economy, and this century’s decision not to exercise power we already have has been a choice. This is America—Paul Manafort gets a light sentence for unprecedented financial crimes, while Kalief Browder served a three year sentence over charges related to a stolen backpack (Browder committed suicide two years after being released—he was 16 when he was charged). 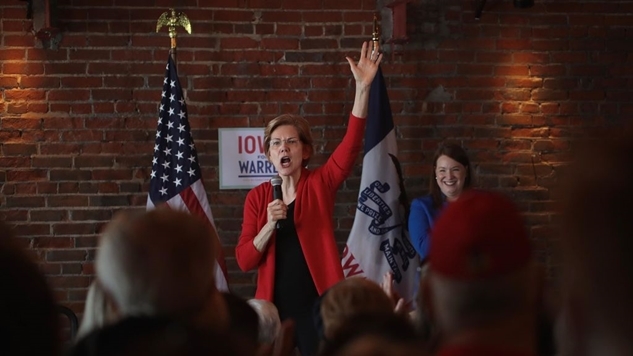 The lesson from the Mueller investigation is that varying degrees of financial crime is our economy, and every liberal should be thankful that Elizabeth Warren is driving a serious policy discussion aimed at the heart of America’s oligarchy. Trump and his kind are not outliers—they are a symptom of our modern Gilded Age. We have the power to fight back against our financial masters, and it’s refreshing to see Democrats finally going on the offensive in ways that can really make a positive difference for the 99% of us who don’t make more than half a million dollars each year.